Manufactured from heavy-duty Climatch 300D fire retardant, UV resistant coated polyester which is extremely hard wearing, incredibly durable as well as being very strong yet beautiful to the touch. The quality of this awning oozes from the moment you open the compression storage bag. The Airdream Lux 340 is very simple and quick to pitch with easy to follow instructions. 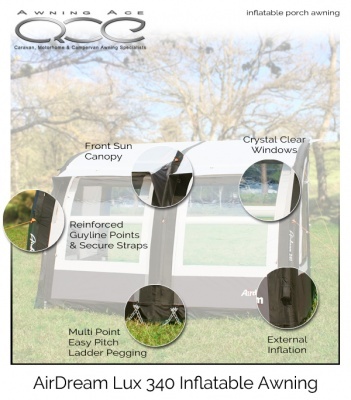 Simply slide the awning onto your caravan, inflate each of the integrated air beams and peg out the awning using the multipoint reinforced ladder band anchor points. Pitched in well under five minutes and you’re ready to make the most of your valuable holiday time. 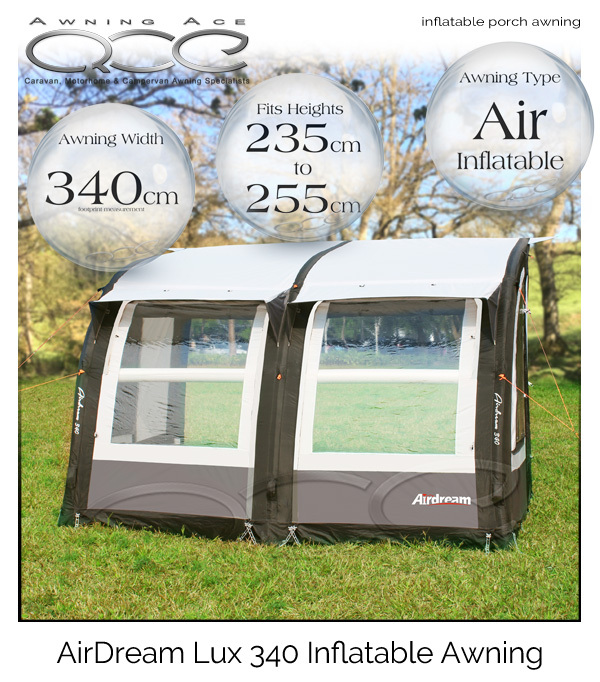 From the front, the Camptech Airdream Lux 340 looks impressive with large extra-wide clear front windows which are framed with individual zipped canopies. The window panels themselves can be dropped to produce a fantastic veranda effect or unzipped and rolled away to open the entire front of the awning. Both front windows have integrated window protectors which give the Airdream Lux 340 a beautifully unique aspect. Each side panel has a large window and entrance door. The side windows can be unzipped to reveal fly screen secondary mesh panels which provide excellent ventilation whilst keeping out those flying bugs. Inflatable optional veranda beams are available for the front panels which look stunning and improve lateral stability during inclement weather conditions. 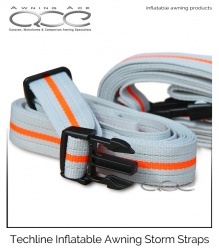 For out of season or coastal campers who experience exposed weather conditions, Techline Storm Secure Straps are available to enhance the guylines provided. This design incorporates heavy duty Techline Smooth Flow Zips which, as the name suggests, have a quality feel and easy glide action. 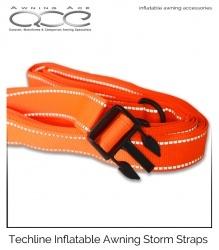 Using high-quality zips ensures your awning will serve you well year after year. This philosophy of extended lifespan is synonymous with Camptech awnings with the Airdream Airdream Lux 340 being no exception. 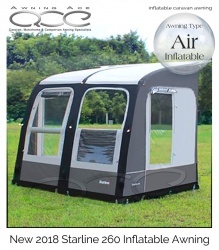 The extra heavy duty airframe tubes, over tube covers and overall build quality make this awning the perfect choice – you will not buy better for less. With its stunningly good looks and modern colour scheme, the Camptech Airdream Lux 340 is the ideal awning for demanding touring caravanner’s, extended holiday campers as well as those who need a heavy duty awning which is incredibly easy to pitch, use, store and enjoy season after season. This refurbished Camptech Airdream Lux 340 awning has some very minor cosmetic marks, mainly on the roof panels, as you would expect from an ex-display awning but is sold here in almost new condition with all original accessories. There is a very minor colour stain underneath the left-hand front window canopy, which is purely cosmetic. This awning, although not brand new, offers exceptional value for money and will not disappoint. 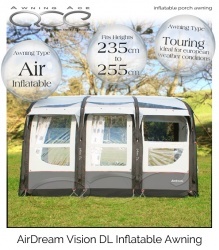 This item really is in excellent condition and represents exceptional value for money for such a durable awning.